James Hammond's look at the aftermath of civil unrest following the murder of a controversial playwright was one of the shows that I'd been particularly looking forward to since the launch of the Fringe Programme. With some high and low points over the course of the play, it was a bit of a rollercoaster ride, and if I left disappointed at all it was only slightly. It's a cleverly constructed piece of theatre which makes the most of a small set. Essentially three short acts, we first see the events leading up to the writer's murder before jumping forward to a time where religious and secular factions battle in the streets. We're given a run through of how law and order broke down and how the writer's children have become involved in the 'war'. Unfortunately Hammond concludes this section with a revelation that seems entirely unnecessary and serves only to distract from an otherwise all too believable reality. I'll avoid detailing the third act as I think it better if this is seen without prior knowledge. I'll just say that it started with me thinking "What the...?" and left me thinking "Nice. Very nice." 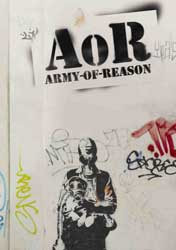 With a strong ensemble cast "Army Of Reason" is slickly presented and may just leave an audience with something to think about.